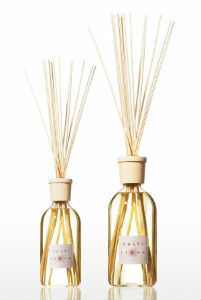 Culti is a permanent evaporator characterized by a delicate spread steadily from rattan sticks dipped in a glass bottle. 250ml (6 months), 500ml in size (about 12 months) or maxi size 1000ml for large environments. Elegant and luxury gift idea for yourself or for friends: ideal for using it at home, in office, in shops. Available in stock in natural essences delicate and tested anti-allergic. Shipping all over Italy (islands excluded) € 8.00.